UM Disability: Deaf Couple Complete Advanced Certified Lay Servant Class -- Leo Yates, jr. 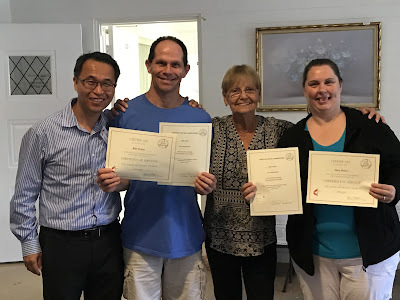 Deaf Couple Complete Advanced Certified Lay Servant Class -- Leo Yates, jr.
For the first time, two Deaf people have completed the Advanced Certified Lay Servant training in the Florida Annual Conference of The United Methodist Church. Billy and Mary Ann Deters, a Deaf couple who are members at St. Andrew United Methodist Church of Titusville FL, participated in the advanced class on April 6-7, 2018. Sign language interpreters were provided so they could fully participate in the training. The couple, who oversee their church’s Deaf ministry, completed the Basic CLS class last year. With encouragement by their pastor, the Rev. Mark Charles, to attend, the Deters enrolled in the Advanced training and feel that the skills gained in the Advanced class will better enable them to do ministry within their church and community. According to Mr. Deters, "I'm so glad for the opportunity to complete the Advanced training. I feel more empowered to help others and to better connect the church with other Deaf people in my community." Mrs. Deters said, "We are glad to have completed the training. They were helpful by providing us with interpreters. We love serving the church and this training gives us more skills for serving." The Deters also shared their gratefulness to their faith community for supporting their ministry and their leadership. Certified Lay Servant classes are often offered by districts and/or annual conferences to support faith communities. These classes prepare students for serving churches in different capacities such as leading Sunday school classes, outreach ministries, leading worship, and congregational care. The Deters family intend to continue serving in Deaf ministry, assisting in worship, and teaching sign language classes, but they will also be working with their pastor to see how else they can serve. They are also active in the Global Ministries Committee on Deaf and Hard of Hearing Ministries. Mr. Deters is a committee member, and Mrs. Deters serves as a resource person for the committee. The majority of certified lay servant trainings are completed by hearing individuals and it is a rarity for Deaf individuals to complete them. Deaf people can share their gifts with faith communities through their gifts of language, culture, and by their presence. Just as important, they too have spiritual gifts for serving the body of Christ. With the Deters completing their training, we hope they'll be trend setters and more Deaf people will take the training. In fact, Mr. Deters added, "I want to see more Deaf people take the training. Pastors need to ask them."